Murfreesboro City Hall is located at 111 West Vine Street, Murfreesboro, TN 37130; phone: 615-893-5210. Photo: This house, located at the north end of Maney Avenue, figured prominently during the Civil War, serving as headquarters for unit commanders of both the Union and Confederate armies. It was visited by Confederate President Jefferson Davis in 1862. The house was built in several, successive stages, the original being ca. 1815 with additions ca. 1825 and 1860. It is a continuum of architectural styles illustrating cultural life in Middle Tennessee during the 19th century. Jack E. Boucher, photographer, 1964. 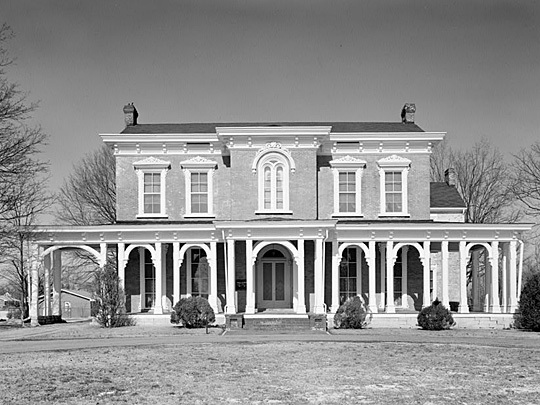 Historic American Buildings Survey [HABS TN-31]. Originally named Cannonsburgh when founded in 1811, Murfreesboro was incorporated in 1818 and named the capital of Tennessee because of its central location. The state capital reverted back to Nashville in 1826. The town is named for Colonel Hardy Murfree who was a friend of Captain William Lytle. Lytle owned the land on which Murfreesboro was created. Murfreesboro lies about 35 miles from Nashville.